The most common symptoms of IBS include gas, bloating, abdominal pain, diarrhea, and/or constipation. Often people with IBS also report other symptoms like fatigue, heartburn, depression, difficulty sleeping, and a poorer quality of life. If this sounds familiar to you, then read on. *Please note that it is essential to be diagnosed with IBS by a medical doctor so that you are accurately diagnosed and screened for other serious medical conditions such as cancer, ulcerative colitis, Crohn’s disease, celiac disease, and endometriosis. With that said, IBS is no longer diagnosed by simply ruling everything else out. 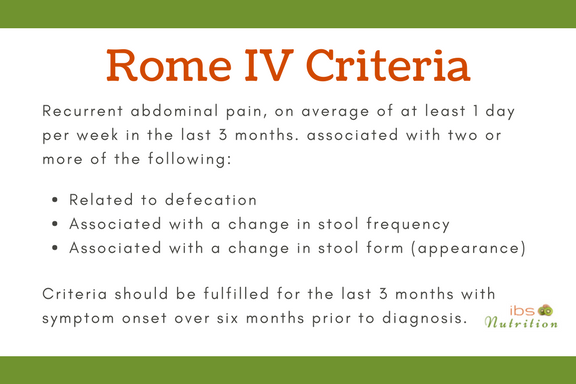 The Rome IV Criteria is used by doctors to clinically diagnose IBS. Worldwide, the Rome IV Criteria is recognized as the most current diagnostic criteria for IBS. It was recently updated in 2016. If you experience any of these symptoms or other symptoms not included, book an appointment to see your doctor. Only a medical doctor can adequately rule out other conditions and properly diagnose IBS. If you’ve already been diagnosed with IBS, the following section will help you understand what may be happening in your digestive system. IBS can be extremely confusing! You can’t diagnose it with a blood test, you can’t find it with an endoscopy or colonoscopy, and figuring out dietary triggers is even more perplexing. You may feel great one day, and then horrible the next with no good explanation. Over the past few years, there has been a growing recognition of the impact that IBS has on quality of life, and we are developing a much better understanding of how to manage IBS. We know that a combination of diet and lifestyle can be life changing! Here are a few key points that will help you understand IBS. We will talk about the effectiveness of the low FODMAP diet in the following posts. Before we get to that, I think it is important to understand a few things about IBS first. Altered Motility. Think of IBS as a motility disorder. Our intestine is controlled by a complex set of nerves and muscles that are designed to move food through in an organized way. With IBS, research shows that the muscles in the intestine don’t always contract and push food through the way they should. Muscle contractions could be too slow, too fast, or poorly organized. Abdominal Hypersensitivity. People with IBS are more sensitive to abdominal pain. In research studies, when a balloon is inflated in the colon of patients with IBS compared to those without, the people with IBS report a much higher degree of pain. Therefore, gas, bloating and other digestive upsets can feel much more painful for people with IBS. Gut Bacteria. We are in the very early stages of discovering the wonders of the bacteria living in our digestive system (microbiome). However, we do know that people with IBS have a different type and a different number of gut bacteria. We also know that we can manipulate the type and number of bacteria with food. It’s a very exciting area of research! Brain-Gut Axis. Our brain and gut have a highly-regulated way of sending messages back and forth. Thoughts, feelings, memories and pain regulation can be relayed to the gut from the brain and vice versa. For people with IBS, this messaging system can be either over active or underactive, depending on the person or the situation. Psychological Factors. Emotions such as fear, anxiety, pain, and stress can have a big effect on your digestive system. Some people may find that emotions stimulate the digestive system, leading to diarrhea, while others may find the opposite. Stress and anxiety may slow down the contractions of the digestive system and lead to bloating abdominal pain and constipation. Dietary Triggers. Over the past few years, researchers have identified a group of rapidly fermentable carbohydrates called FODMAPs that are know to trigger symptoms in people with IBS. The low FODMAP diet is a therapeutic diet specifically designed to manage IBS symptoms. All, or a combination of these factors may lead to a diverse and individualized set of digestive symptoms for you. As you can see, so many of the factors are intimately related. Now, your next step is to learn how you can manage these symptoms with the most effective dietary recommendations using the low FODMAP diet and a few other strategies. The low FODMAP is shown to improve symptoms of IBS for more than 75% of people. You don’t have to learn all of this on your own. I’m a FODMAP trained registered dietitian and Certified Craving Change Practitioner based in Edmonton, Canada. I provide one on one nutrition counselling for IBS and the low FODMAP diet by phone, video call and email across Canada. I would love to help you get started on the low FODMAP diet. If you are curious, please call me or click here to schedule a free call. Best Practice Journal. Irritable bowel syndrome in adults: not just a gut feeling. BPJ. 2014:58. Drossman, D. A. Functional gastrointestinal disorders: history, pathophysiology, clinical features, and Rome IV. Gastroenterology. 2016: 150: 1262-1279. Nanayakkara, R. S., Kidmore, P.M., O’Brien, L. Wilkinson, T. J., and Gearry, R.B. Efficacy of the low FODMAP diet for treating irritable bowel syndrome: the evidence to date. Clinical and Experimental Gastroenterology. 2016: 9: 131-142.